The veracity of events during 17th century, and especially the persecution of the people, is poorly documented and thus always contentious. Opinions vary greatly and were especially inclined to the romantic in Victorian times. The arguements whether any particular event even took place, let alone the common day to day atrocities of the soldiery, fed one school. The other extreme coloured the events with great compassion, religious zeal, martyrdom and hyperbole. Somewhere in between is the truth of events that occurred during what were undeniably cruel and savage times. William E. Aytoun,(1813-1865) Professor of Rhetoric and English Language at Edinburgh University (Victorian apologist and romantic school), took the historian and lawyer T. B.Macaulay(1800-1859) to task basing his criticism on an error (possibly a proof reading oversight) in Macaulays History of England that confused the Graham / Graeme names – John being Claverhouse and James being Montrose. This led him to a vituperative assault on the credibility of the traditions of the Covenanters and a blinkered defence of Claverhouse. Aytoun clearly disliked and rejected virtually everything Wodrow had to say, complaining that Wodrow`s notes, comments and publication was some thirty six years after the events spoken of. But Aytoun himself propounds a different view, without new evidence, some one hundred and thirty years later. Moreover he has used as a source of quotations the works of the arch apologist Mark Napier, who denied for example, the execution of the Solway Martyrs. Such is the way of academia, the truth must not get in the way of their own pomposity and opinions. After the painting by James Drummond RSA. 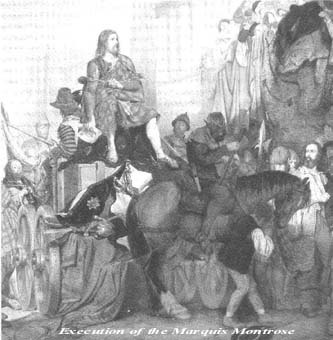 The following poem of Montrose`s execution is reproduced from Lays of the Scottish Cavaliers by Aytoun (1849). Upon the verge of night. How the great Marquis died. And bared his noble brow. And their daughters all a-row. Now turned aside and wept. Till it reached the house of doom. And he turned his eyes away. Not all their troops of trampling horse-. Had borne us backwards then. Been laid around him there ! The ‘harm of the drum. The ladder and the tree! Of earth and sun and day. As it were the path to heaven. Montrose`s own poetry is very poignant and shows that he had no doubts what was to happen to him.